HOW TO BE THE FIRST PERSON WATCHING LATEST BTS’S VIDEO? If there any BTS MV, BTS Shows but it requires a fee for it, this BTStube is perfectly tailored for you. This BTS video app is a collection of every BTS related videos, such as BTS MV, BTS shows (Bon Voyage, Run BTS,...), BTS dance, BTS funny,...updated frequently. Now they are all in one. This BTStube helps you save every BTS videos that you can keep it to watch every time, everywhere. You don't need to find other BTS videos that you don't know, because they all are here, you just need to open it and enjoy it. - Free: You don't need to pay any fee to watch any BTS video. - Video Engsub: We collect all show videos with Engsub. This app provides not only the diverse experience of topics but also HD, 4K Quality of videos. If you are a fan of BTS Wallpaper or BTS Music, this app will be the combination of all, providing Army the best experience with BTS Members. - Diverse story: We always try our best to find out the special moments of BTS members to help our audience to follow closely. 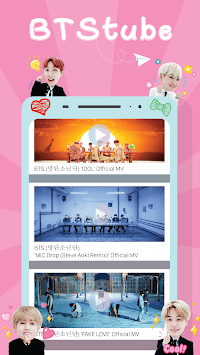 This app also suggest you suitable videos that can help you to relax and grow the emotion with BTS Members. What factors has your BTS apps, whatever you have, it is a big missing if you don’t append this app immediately, and you can follow all aspects of BTS. I’m sure that you will always be the first person that know the latest news and MV of BTS!